For Joyce Stechmiller, improving patient care is the motivation for research. Targeting patient needs among the elderly nursing home population, Stechmiller leads a study of the relationship between arginine, an amino acid that enhances immune function in healthy adults, and pressure ulcers. With funding from the National Institute of Nursing Research, Stechmiller also focuses on nitric oxide, which plays a role in killing bacteria and inhibiting lymphocyte proliferation. Her research is critical to the prevention and healing of pressure ulcers, all-too-prevalent among the nursing home population. In additional research funded by a grant from Ross Products Division, Stechmiller collaborated with a colleague to implement the study of an immune-maintaining supplement for adults 65 years and older. “Our ability to fight infection decreases with age,” Stechmiller explains. She and her colleague hope the “experimental nutritional liquid supplement” will impact the ability of older adults to fight infection during cold and flu season. Stechmiller, a well-respected scholar-teacher who received her Ph.D. in educational psychology from UF, actively seeks to educate and inform others. 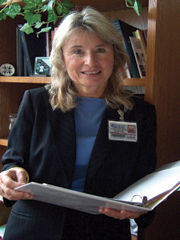 She has garnered national recognition for her contributions to adult critical care nursing education programs, her many presentations on patient care in critical care nursing, nutrition and immune function and her publications in nursing journals such as Clinical Nursing Research, American Journal of Critical Care and the Journal of Neurosurgical Nursing.